Within its limits, it is as deadly as any shotgun. Anyone who’s stepped on a flopping turkey’s neck can agree that these birds are incredibly powerful. On one occasion, I shot a gobbler from 15 yards away with my bow, my 1 ¾-inch broadhead shredding both lungs before my arrow passed through and drove into the dirt beyond him. He took flight as I looked on in wide-eyed bewilderment. He flew approximately 150 yards before dying in midair and walloping the ground, never moving again. I wouldn’t have believed it if I hadn’t seen it. Of course, this would suggest that shotgunners would do best to tote a large-bored shotgun like a 12- or 10-gauge. Yes, the 12-gauge is arguably the most popular turkey gun, but it doesn’t mean everyone can or should shoot one. It also won’t kill a turkey better at 20 yards than a dense-patterning 20-gauge, 28-gauge or .410-bore shotgun. I’ve killed turkeys inside 20 yards with everything from the .410-bore all the way up to a double-barreled 10-gauge. All crumpled in place and flopped for a minute or two before going limp. Of course, my Benelli 12-gauge is my go-to turkey rig if I’m out to fill a tag. Any unobstructed bird standing still within 60 yards is toast; I’ve spent hours with different loads and choke tubes to deem the gun more than adequate for a 60-yard bird in ideal, non-windy conditions. So, why in the world would I hunt with a .410-bore when I have a weapon that can and has claimed birds out to 60 yards? The experience. Birds at 40-plus yards simply don’t provide the same level of adrenaline rush as a bird within 20 yards. Half of why I hunt turkeys is to watch and observe them at close ranges. I love it. I’ve rolled over dozens of turkeys with the beloved 12-gauge — dozens more with archery gear — so I naturally welcome new challenges like toting a .410-bore shotgun to the turkey woods. Plus, the light recoil is a welcome attribute after being whopped countless times by the shoulder-shocking recoil of magnum 12-gauge turkey loads. 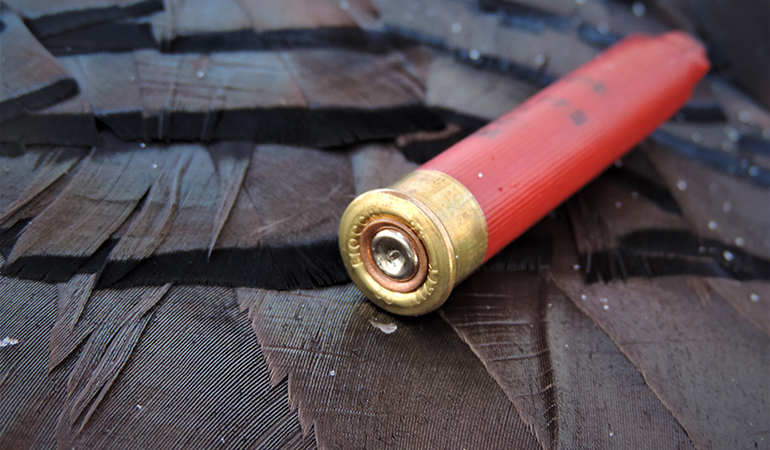 Many skeptics believe hunting turkeys with a .410-bore will result in unrecovered birds. From experience, I can debunk that myth. It’s not the gun’s fault if you wound and lose a bird; it’s your fault. Period. Everyone must understand that every individual shotgun has an effective range in the turkey woods, be it 15 yards or 55. Shooting skills also contribute to that effective range. Stretch the boundaries of your gun’s and your effective range — even with the tightest-patterning 12-gauge — and yes, you’ll inevitably wound and lose turkeys. The ethical thing to do is spend as much time as necessary shooting your weapon of choice to determine the maximum range at which it will cleanly clock out a turkey. While one spine hit can immobilize a bird, I’m looking for more than six spine hits with multiple more in the head and neck. While testing my grandpa’s time-worn, break-barrel .410 bore, I shot two types of loads at distances ranging from 10-25 yards. The gun has a full-choke barrel with no option to interchange choke tubes. At 10 yards, the entire wad hit the turkey target’s neck right beneath the head, likely a decapitating blow for a real bird. At 25 yards, I got three spine hits at best. At 20 yards, I consistently got eight to 10 spine hits. Interestingly, the gun produced better density at 20 yards with Fiocchi’s Exacta 2 ½-inch load with only a ½ ounce of #9 shot than Winchester’s 3-inch Super X with 11/16 ounces of #6 shot. In my opinion, pattern density wins over weight. And when I shot metal coffee cans from 20 yards with the light loads, the coffee can was blown back several yards, proving the density, combined with the 1,250-fps velocity, was more than adequate for a turkey head. After pattern-testing the old gun, I vowed that 20 yards was my limit. If a turkey stepped out at 21 yards, I’d hold my fire. Note: I understand that Federal’s Heavyweight TSS shot is a superior load if you’re looking to create a .410-bore turkey gun that can reach out a bit farther, but that was never my goal with this test. I simply wanted to prove that a plain-Jane .410 like the early pioneers carried with basic loads is a deadly turkey gun within its limits. Last December, I toted my grandpa’s old .410 to the turkey blind to validate my range results. I’d scouted 50 birds one evening, and simply returned at first light the following morning to set up where they’d been feeding the previous evening. With words, I can’t describe how brutal the conditions were, but I’ll try. Picture this: 40- to 50-mph winds were blowing snow off the ground, creating snow sheets and even whiteout conditions. A hub on my blind continued popping in every so often from the powerful winds. And, it was approximately -34°F with the wind chill. I truly believe I was the only one dumb enough to be hunting turkeys in Wisconsin that day. I mean it. Even with a propane heater and multiple chemical toe, hand and body warmers stuffed in every nook and cranny, I got very cold. Though I was set up next to a huge swath of picked cornfield where the birds had been tilling the snow for at least several consecutive days, it became obvious that they weren’t going to come out to feed that day. The conditions were simply too brutal. I honestly believe the winds would’ve blown them off the field. No joke. I couldn’t take the cold in my stationary ambush, so I left the blind, sneaked across the field to some short red pines, then hooked left toward a swamp where the birds habitually roost. I inched along as I looked through my binos. Finally, I spotted them. The stalk was on. I crawled toward the 50-bird flock, which was huddled in the swamp where the wind was maybe 30 mph instead of 50. 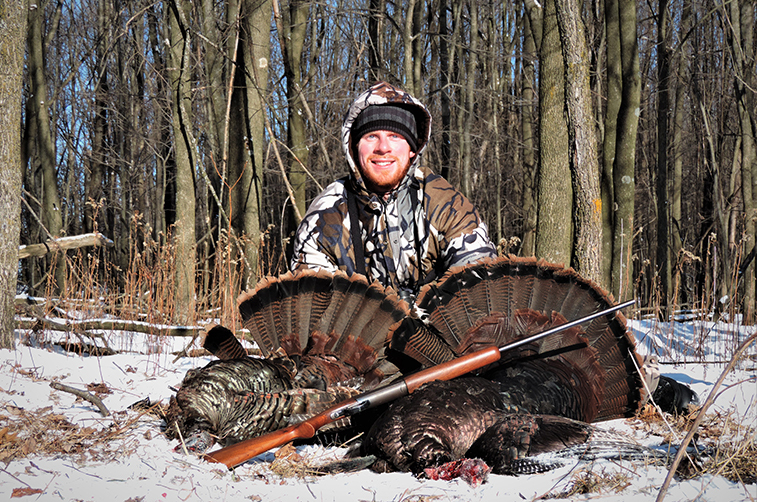 Before long, I’d crawled to 22 yards from a tom perched on a log. I knew I had to be at least 2 yards closer. I pulled my prone body forward two times, then ranged the tom again., this time at 20 yards. With the flock still unaware, I elected to pull myself 2 yards ahead and make it an 18-yard shot. I cocked the hammer back, rose up fluidly — the wind and rustling grass disguising me — and buried the bead underneath his beak. The swarm of shot blew him off his feet, and as he was flopping, I ejected the spent shell and grabbed a second from my clenched teeth. A departing hen that I hadn’t seen was now only 12 yards away, so I leveled the bead on her head and filled my second tag. Once the flopping had finished, I nearly froze my fingers off while trying to capture some images. But, as I slung both birds over my shoulders and headed for the shelter and warmth of my pickup, I felt an overwhelming sense of satisfaction in knowing that I’d completed the task I set out to accomplish. The .410 — in its limits — is, in fact, a deadly turkey gun.